Despite the standard practice among forensic anthropologists (see How Pros Recover Bodies and Solve Murder Mysteries), the Smithsonian experts, Drs. Ubelaker and Owsley, were not on hand at the crime scene to excavate the bodies. The damaged roof was not shored up and over a period of ten days, crumbling concrete was permitted to shower down onto the spent cartridges and the remains below. Mr. Jahn: Okay. And once you started shoveling, as you removed the—the—the shells or the other debris that you found, did you encounter other problems? Sgt. Coffman: Yes, we did. Mr. Jahn: And what were those? Sgt. Coffman: Well, we had live—live ammunition, we had live grenades, that sort of thing. Also, we began uncovering bodies, and that slowed down the process, also. Mr. Jahn: All right. When—when a body was discovered, what procedure would be used? Sgt. Coffman: We would contact the medical examiner's office. They had people there on hand, they were actually handling the bodies, and we would kind of excavate around the bodies and then they would actually come in and remove them. Mr. Jahn: Okay. And then once the bodies were removed, what did you do after that? Note that this account does not comport with Dr. Peerwani's testimony. Clearing the room took five days with bodies being incidentally recovered as the Rangers dug through to the back wall. If the Rangers started the process on April 20, the process would have been complete by April 25. Yet Dr. Peerwani did not describe such a process. He said the first bodies were recovered on April 22-23, the buried bodies recovered on April 27-29. (See The Locals Speak and Remains Recovered from the Concrete Room, showing the locations and dates of body recovery). Sgt. Coffman described how the damaged roof was allowed to degrade slowly day after day. It was not shored up, as Dr. Peerwani claimed in his testimony. Sgt. Coffman: And also the—as I've said earlier, the—the roof was beginning to sag more and more. It got down to probably—dropped two feet, and these are concrete, about six inches thick. We were concerned for our safety, mainly and during that time "the roof was beginning to sag more and more." (Transcript, pg. 904). Sgt. Coffman: "… it started out probably 18 to 24 inches across and progressively got bigger." Mr. Tinker: So it was about the size of a manhole cover? The photo of the hole Sgt. 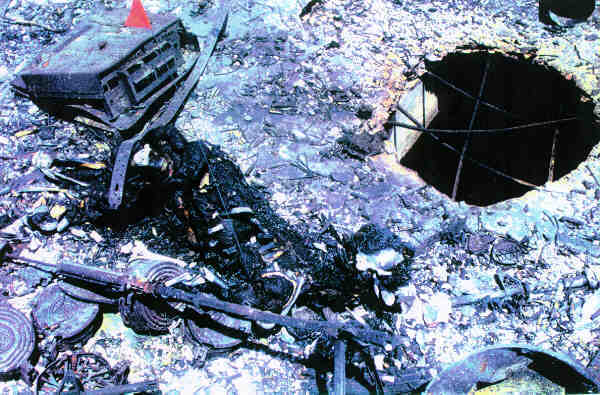 Coffman was talking about was viewed in The Bunker that Wasn't a Bunker Didn't Collapse and can be see in Hole in Roof of Concrete Room (donated to the Museum by an unofficial source). Note that the reinforcement bar (or "rebar") is still in place and visible. Yet Peerwani said the bodies were buried in debris … from the collapse of the "bunker" … and Drs. Ubelaker and Owsley of the Smithsonian Institution were the experts who did the anthropological examinations (for example, see Pg. 5 of Autopsy Report Mt. Carmel Doe 51). Drs. Peerwani and Crow were present on April 21 when the hole in the roof was comparatively small. They probably would have seen little concrete rubble on that date. But the crumbling of the roof during the following days proved to be convenient. The rubble accumulated as the time passed, and was apparently loaded into the body bags along with the remains of the mothers and children. Then the utterly false explanation that many victims were buried by "structural collapse" was memorialized in the Autopsy Reports. The participation of the Smithsonian experts in the recovery and the appearance of their names on the Autopsy Reports added authority to Dr. Peerwani's testimony, yet their signatures were not on the reports, nor did they back up Dr. Peerwani's claims under oath. This false assignments of cause of death also appears in the Department of Justice Report, even though the FBI and Smithsonian Institution personnel should have known the truth, and may even have had a significant hand in the final version of the DoJ Report. Any finding on the Autopsy Reports that the cause of death was suffocation or blunt force trauma due to structural collapse is false and fraud on the court. With one exception, all such autopsies were performed by either Gary Sisler, D.O. or Marc Krause, M.D. Perhaps Drs. Sisler and Krause were relying on the construction debris in the body bags, or the reports of those who had visited the site. Next: What About the Explosion?